This is probably one of the wrong-est things I have ever made. And it will also be the last thing I make for the HHDD challenge for a long time. Or anything else in a kitchen for that matter. I will probably only have access again to one again around December, but more about that in another entry. Suzanna of Home Gourmets, winner of the Tiramisu challenge, picked pancakes as the task for this round. To me, pancakes seemed quite a challenge! Sure it seems simple, but I think that is where the big challenge lies, making something so simple interesting and fresh. While worrying about everything that needs to prepared for the next big move, I was racking my brain about what to do for this challenge. I thought I could try to draw some inspiration from where I live again, but I’ve done that for the Choux round. 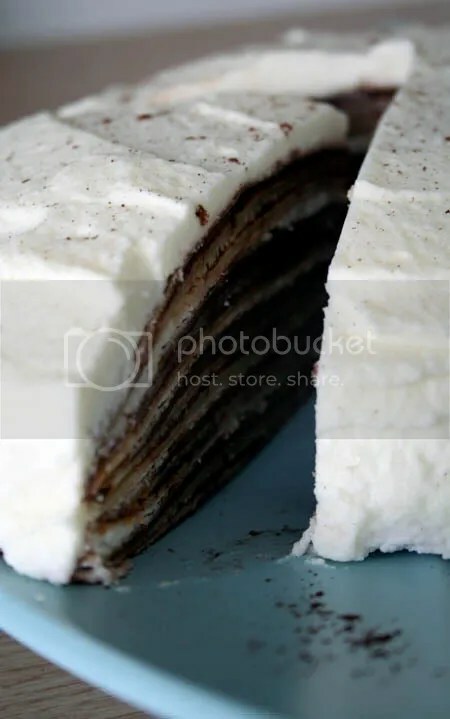 On Thursday we went to Vanilla Industry for coffee and I decided to try the vanilla crepe cake. 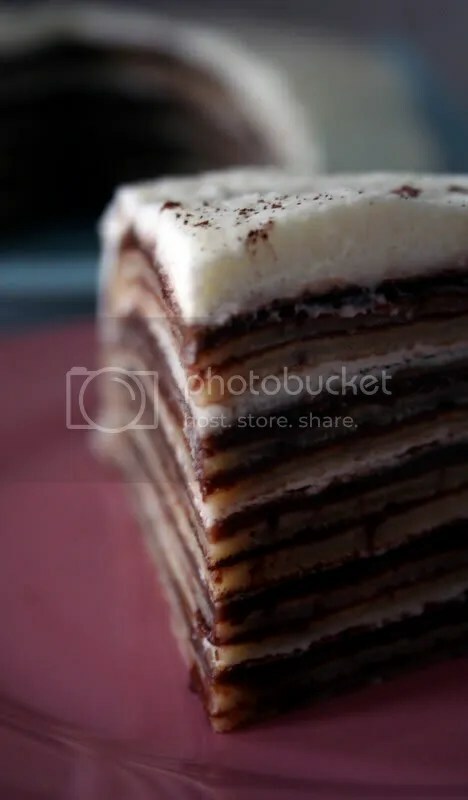 As I was enjoying the layers of pancake and vanilla spread I thought, maybe I will not exactly make pancakes, but make a cake out of pancakes! 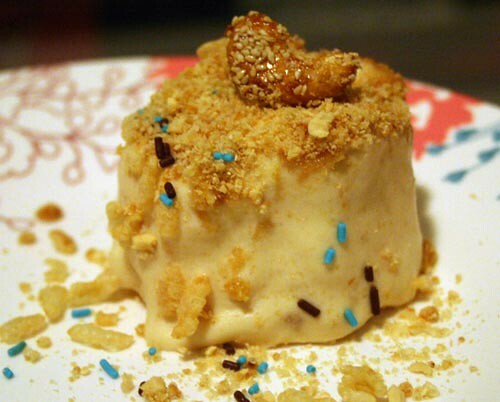 A Nutella pancake-cake covered in sweet and rich almond flavored cream. So there is a good chance I completely missed the plot here, but I had fun. And its very very decadent. Mix together the dry ingredients in one bowl and the wet ingredients in another, combing them in the end and mixing well. I made the batter a little thinner to create a more crepe-like pancake. I also added some brown food coloring to the last third of the batter to make some darker pancakes. Cook the pancakes in a heated pan, slightly greased, and let them cool. I whipped up the cream, essence and sugar until it was thick enough to serve as ‘icing’ for the cake. The I spread Nutella on the lighter pancakes and layer two light ones topped with a darker one. 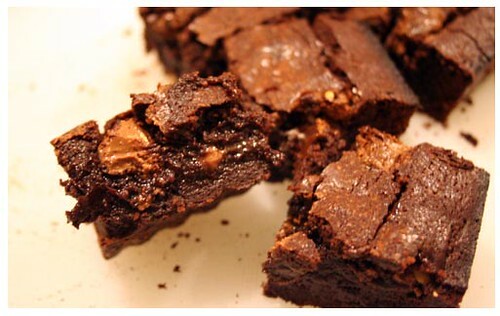 Spread a thin layer of the cream on the this one and cover with two Nutella spread ones again. Continue with this process and top it with a dark pancake. 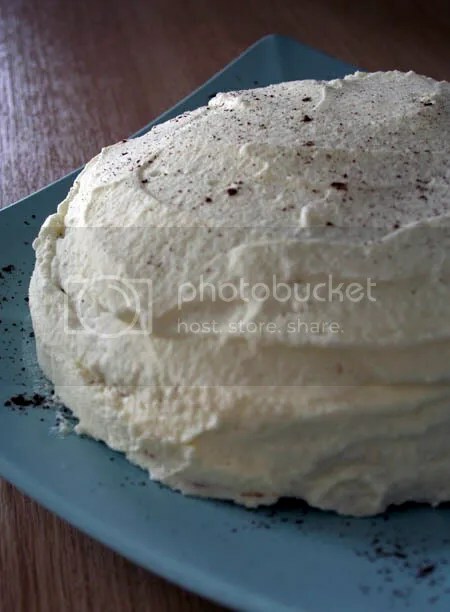 Cover the rest of the cake with a thick layer of cream and carefully move to the fridge to set. When the cake has set, slice and serve. A warning, not that it’s not obvious I think, but this is extremely rich and heart-attack inducing. I think I actually gained weight while making it. Enjoy! On a completely separate note. Yesterday, after coffee, Alexander and I were walking around Siam Paragon when a girl approached us. It turns out she is a reader of both our blogs! Thanks for saying hi, it meant a lot to us even though we were both so surprised that we did not even ask your name or chatted a bit more. And thanks for reading! And thank you to Alexander for the pictures. 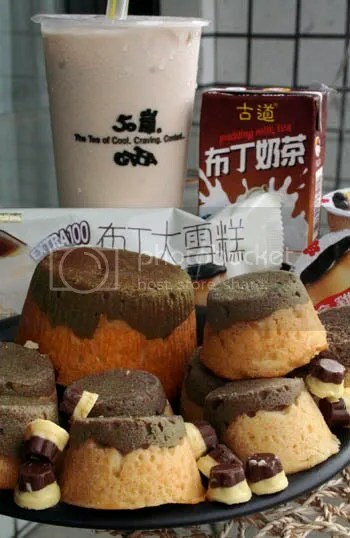 Pudding seems to be a bit of a national obsession here in Taiwan. It’s something that I was only vaguely aware of when I lived here. 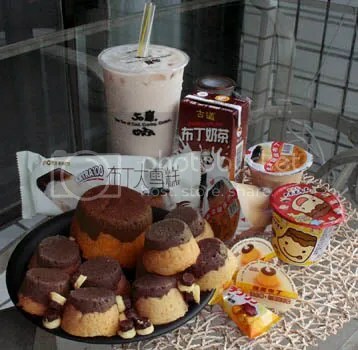 Kids bringing little cups of pudding to school to snack on, pudding being added to milk tea, and pudding popsicles. But I never thought about it much until my ever-aware boyfriend pointed out how it is everywhere. Pudding drinks at 7/11, notebooks with pudding cartoon characters, pudding on shaved ice, pudding candy. It is literally everywhere! So when I decided to bake some muffins inspired by something local I did not spend a long time pondering inspiration. It was going to be pudding muffins. Which turned out to be more like cupcakes, and they looked horrible to be quite honest. So I’m going to be very honest with you here, I did a lot editing on these in Photoshop. As I have not had time to bake them again and perfect my recipe I decided to only blog the images for now. I used a lemon poppy seed muffin recipe, but did not add enough pudding flavoring, so they ended up being very plain. I also attempted to make brown food coloring for the tops by mixing red and green, or red and blue, I forget, and it came out looking rather gray. That is where the editing came in handy. After baking and cooling the muffins I cut off the tops and turned them upside down to resemble the popular local pudding. 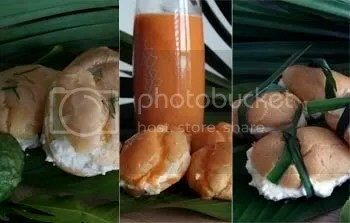 I know this is being very lazy of me, editing pictures, not posting a proper recipe and all that. 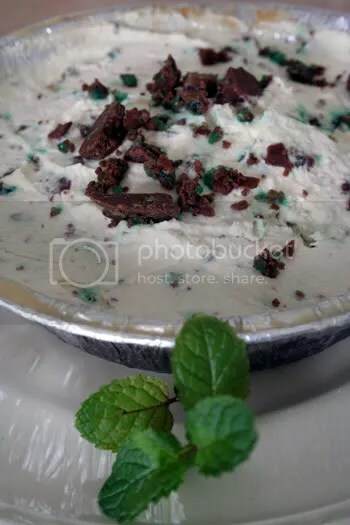 But I promise I will make amends and bake them again and make them look real pretty and have everything ready right from the start and blog a decent recipe with un-edited pictures soon, maybe! It’s almost HHDD deadline time again, all things choux this time, and for a moment there I thought I was not going to make it. But here I am, right on the cut-off date again, with my entry. As with the clafoutis this was a new challenge for me and one I really wanted to try. Every time I ever bit into an eclaire or profiterole I thought to myself that it must be a really tricky process to create something so decadent and rich, yet light and airy. But Suzanne, decided to prove me wrong. Making the choux dough necessary for these kinds of pastries takes a little time, but the ingredients are really simple and easy to work with. I was pleasantly surprised to see the first batch taking shape in the oven and retaining their puff after I removed them. Well most of them, I became a bit to excited after a while and disregarded Suzanne’s suggestion to leave it in a little longer, ensuring they do not slowly deflate after being removed. Yes, lessons are being learned. I decided to stick to the original Donna Hay recipe, as slightly amended by our host (adding about 3 additional tablespoons of flour) and create profiteroles. For the filling I took inspiration from some local ingredients and sweets. Kaffir lime is a flavoring used in numerous Thai dishes. The leaves are used to flavor soups and salads, while the fruit’s rind gets used in the making of numerous curry pastes. The fruit yields no juice, oddly enough, so only the rind and leaves are used. Thai iced tea can be found at any coffee and tea stand on the streets of Bangkok and is a refreshing rich and sweet drink, creamsicle orange in color. 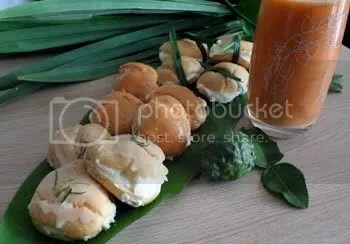 Pandanus is a kind of palm leaf that is used a s flavoring in lots of Thai sweets and desserts. Some call it an Asian vanilla. A simple but fairly representative collection of regional favorites. Preheat the oven to 180C and prepare a baking sheet with parchment paper. Bring the water and butter to a boil over high heat in a saucepan. Slowly add the flour, making sure clumps do not form. Continue stirring over low heat until the dough leaves the sides of the pan. Pour this into a mixer or mixing bowl and mix with an electric mixer on high, adding the eggs one at a time. Make sure each egg is completely mixed in before adding the next. 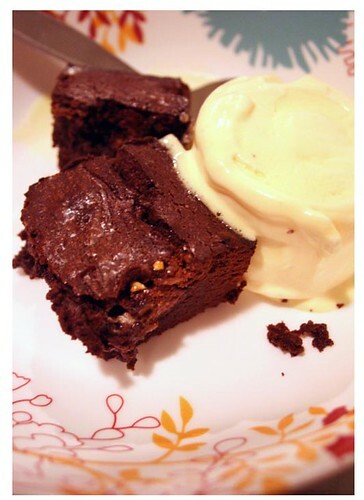 Keep on mixing until the dough resembles very thick mayonnaise. Spoon the dough into a piping bag with a 12mm plain nozzle (if you do not have one, a Ziploc bag with a hole cut to size in one of the corners works just as well) and pipe about 2cm rounds onto your prepared baking sheets. Bake for 20-25 minutes until golden and puffy. Remove from the oven and let cool on a wire rack. While the baking is taking place, add the icing sugar to the cream and mix it through. Divide this into thirds and add a flavoring to each. 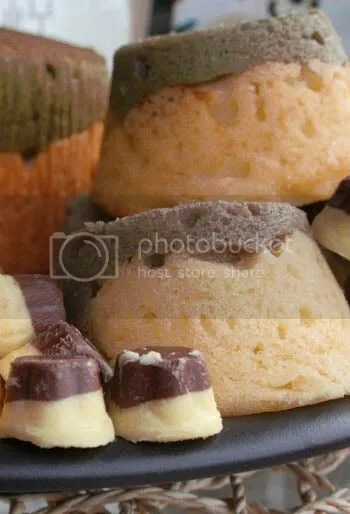 When the pastry has cooled, cut open and spoon generous helpings of the flavored cream into them. Not all into one of course, that may be a bit too weird. I added some simple icing as topping to the tea and kaffir lime ones. I mixed a bit of icing sugar and milk together, divided it and add some powdered tea to one half. Mainly for some color on top of the profiteroles. 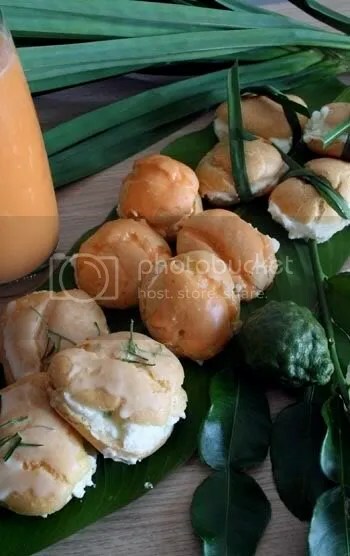 The rest I kept plain and brushed it over the tops of the lime roles with thinly sliced slivers of kaffir lime leaves on top. The pandanus ones I bound with thin strips of fresh pandanus leaf. They tasted great. So said my only loyal taster (not that he has much choice). The puffs were firm, yet airy, and the creamy fillings subtly flavored in a few of the tastes of my current home. Phew, in goes my entry for this edition- Choux! Note- Thank you again to Alexander for the great pictures of my baking. 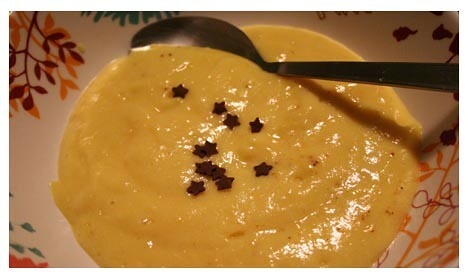 It’s a Kind of Custard and it is Deeelicious! 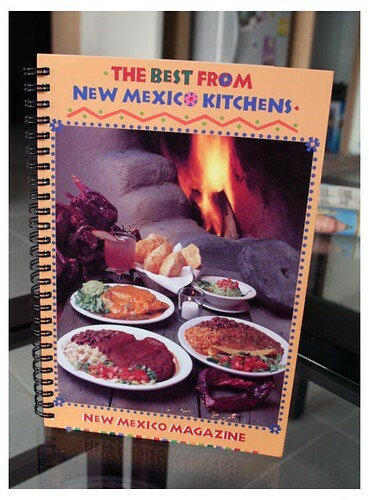 Visiting Alexander’s family in Albuquerque, New Mexico, last year I got so excited about all the mouth-watering New Mexican dishes that for Christmas they sent me this exciting and instructive cook book with recipes from their home state. It gives a history of NM cooking and includes a wide variety of recipes to reflect the state’s rich cultural heritage, from green chili to moussaka. Awesome! I started using it the moment I opened it and experimented with quite a few recipes like the signature New Mexican green chili (I love this stuff), chili rejenos, Navajo fry bread and green chili enchiladas. All lip-smacking goodness. 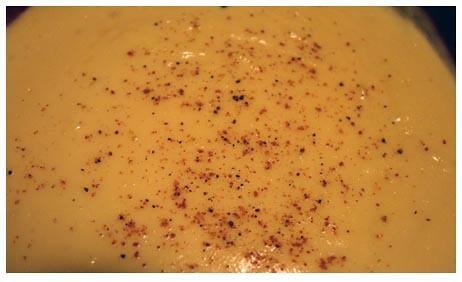 Yesterday I tried my hand at natillas, a custard dessert with a Spanish origin. Alexander told me he has a great aunt who used to make really delectable natillas, so I was a nervous about how my efforts would come out. Oh, but no fear was necessary. It came out just lovely. 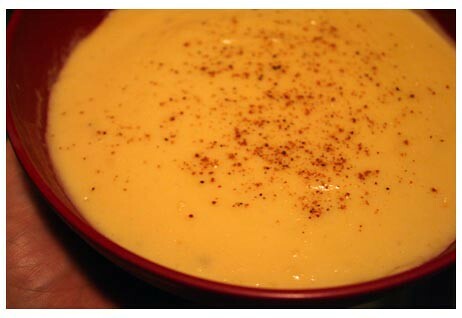 A rich, pale yellow custard that begged to be savored and eaten in large quantities. Mmm, give me more of that! So here is how you make natillas, and you really should try it. It’s decadent! Mix the egg yolks, one cup of the milk and flour well and set aside. Pour the rest of the milk into a saucepan with the sugar and salt and scald, stirring constantly so the sugar dissolve. 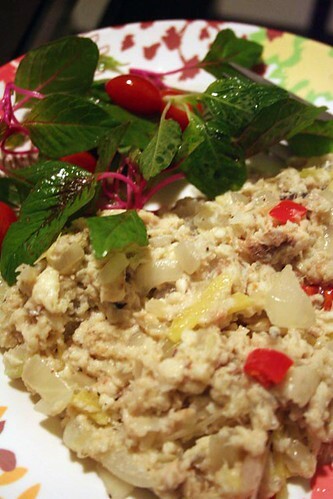 Remove from heat and gradually stir it into the egg yolk mixture. 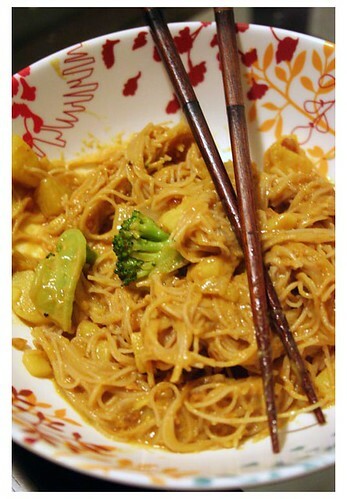 Return to low and heat and stir constantly until the mixture is thick and creamy. Remove from heat, stir in vanilla and set aside to cool. In the meantime, beat the egg whites until they are stiff, but not dry. Fold them into the cooled mixture. 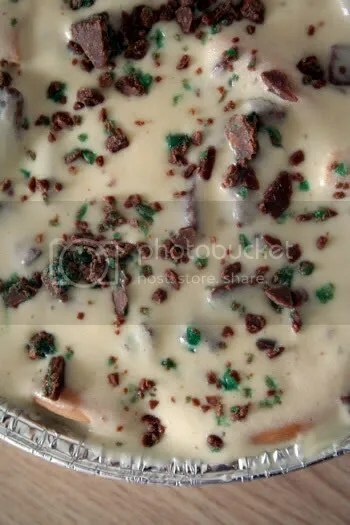 Pour it all into a bowl, sprinkles with some nutmeg and chill (it) before serving. When eating, make sure you scrape your bowl properly to let none of this goodness go to waste. 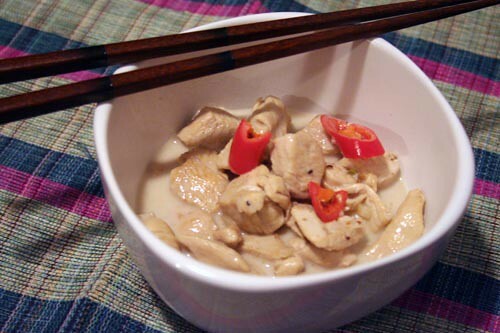 – The recipe book suggested it should take about 30 minutes for the mixture to thicken, but on our gas stove and in the wok it took about 10 minutes, so watch it carefully. 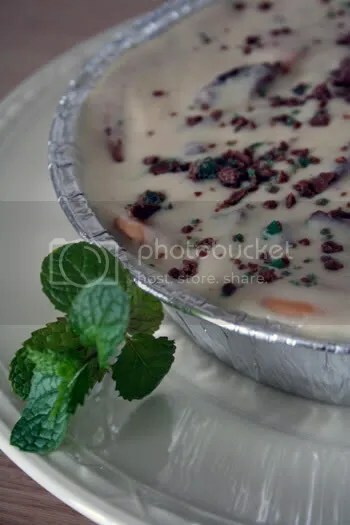 – You can decorate your servings natillas with some sprinkles or some more nutmeg and I am certain that dropping some chocolate shavings would add to the attraction.